I recommend that all new parents and students attend a lesson of a current student for observation before their first lesson, as well as scheduling an introductory "trial" lesson. This gives you an opportunity to meet me and learn a little about how lessons are run before committing to the entire session. At your first lesson all you should bring is your Suzuki book and a notebook to take notes in. I will provide you with a foot chart, box violin, and stick bow. I'll also take measurements so when the student is ready for the real violin, you'll know what size to get. All Suzuki lessons begin and with a bow. The very first thing students learn is rest position and bowing. From there, we will go on to setting the bow hold and proper playing position with the box violin. I start children on a box violin for a few reasons. First, they learn how to handle an instrument. 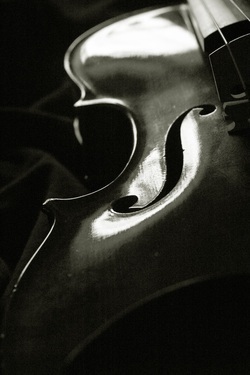 This means that when they get the real violin, they are less likely to handle it in a way that would cause harm to it. The second reason is because it sets their right arm in the proper arc to make a great sound right away on the real violin. I don't keep kids long on the box; the allure of playing is that they get to make sound! At the end of the first lesson, you'll have an assignment for the week. If you have any questions, please contact me. After the first lesson your child is on their way!